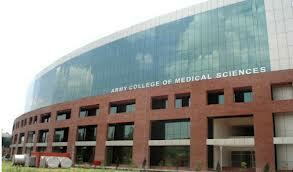 Army College of Medical Sciences,New Delhi,Admission, Courses, Fees, Photos and Campus Video, Review, Ranking Details. Army College of Medical Science (also known as ACMS New Delhi) is an Indian medical college affiliated with Guru Gobind Singh Indraprastha University.It is supported by Army Welfare Education Society (AWES) of Indian Army for wards of Defense Personnel only. It is situated near the Base Hospital, New Delhi. The annual intake of students to this college is 100 students.